Tushar Goyal is one of those entrepreneurs who embarked on the technology bandwagon seeking untapped opportunities. With the combination of broad business acumen, technical depth and ability to coalesce disparate organizational elements, he has proven his technical capabilities with the successful launch of applications under several domains. He has often been applauded for his transparency, speed, and accuracy in the development of various mobile applications. 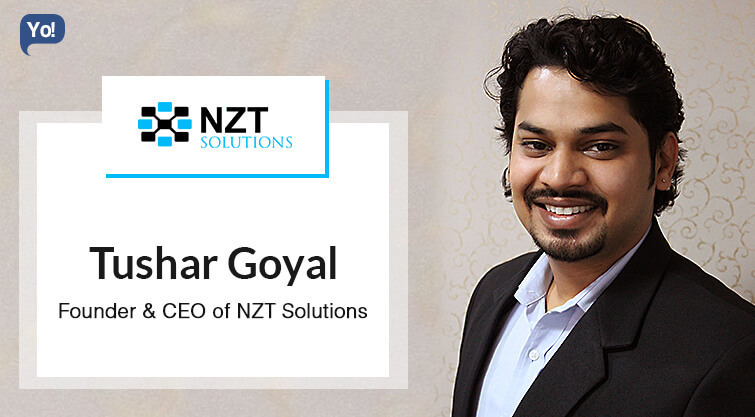 Tushar has a passion for perfection and his leadership skill set as well as his pool of intense knowledge in application software, has propelled his startup, NZT Solutions into the mainstream world. After successfully completing his Bachelors in Technology (B.Tech) in Electronics & Communication from National Institute of Technology Kurukshetra, he gained ample experience in the field of Project Management and Sales. After that, he launched his own business NZT Solutions, a mobile application development firm. NZT Solutions is a new age Mobile App Development venture, located in New Delhi having a presence in the UK, US & Singapore. Our top-notch services are backed by a strong team of 100+ proficient, creative thinkers, strategists, designers & developers who have rich experience in app development. We assure to deliver innovative, secure and scalable IT solutions to our clients. With robust backend and scalable technology architecture, we provide our clients control over information, flow and data transaction on their cloud and dedicated servers. Mobile phones are on hype these days. India stands second in the world, in the number of active mobile phones. It is great to know that $53 billion industry three years back is expected to be $143 billion industry by 2016. The applications are transforming into a gigantic delivery channel. B2C apps have won the number of games, and B2B is catching up fast as all the solutions that enterprises are going mobile. With the increase in the number and make of mobile phones, there comes a demand for better applications which has ultimately inspired me to build the product/ services. Find your passion and offer Limitless innovation. The most challenging part was scalability and maintaining quality for low-value projects and hire dedicated, committed professionals. Our biggest challenge has been building NZT Solutions to be powerful and flexible enough to work for a wide range of organizations while maintaining quality for all. great success that we are able to cope up with the challenges. NZT Solutions is 100% self-funded company. There are not any mantra’s or supernatural powers to make an individual rich and successful. It is the habits that can help you to achieve success. I never compete with anyone. I always compete with myself which makes me more productive. Not work for late hours in the night. Work for excellence. Never work for money. Because money is incidence. It diverts your pathway. It’s okay to make mistakes or lose. Just try not to make the same mistakes repeatedly and remember to lose graciously. We have been meeting our milestones to date since our investment round. Everyone wants to be a big company. We meet our clients and are meeting growth milestones as they come. Our main focus is to achieve quality growth with high client satisfaction as opposed to desperately building numbers while leaving the customer as an afterthought. We have already expanded our company on different platforms Ruby on Rails, VOIP technologies and many app verticals like travel apps, E-commerce apps, Business Apps, Food Ordering delivery apps, etc. So I would also like to see NZT Solutions amongst the top 20 mobile app development companies of the world in next 3 years. If I get this chance again, I’ll definitely prefer to be an entrepreneur from very first day.